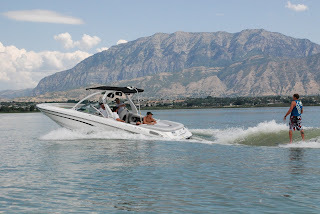 Come join on us on Utah Lakefor a day or week of watersports, we bring the professioanl wakeboarding ski boat equipped with surf package for the ultimate surf wave. We will have all the equipment needed for the ultimate watersports vacation. Waterski, wakeboard, Wake surf, Wake skate, tubing, what ever you favorite activity is on the water we are equiped to help you have fun. We take all the work out of the fun, you show up we deliver and opperate the boat do all the clean up you and your group just have fun. We pride ourself in our service. TK Watersports will have the boat already there saving on cost. This is a great value even for boat owners you can get an early trip with out the hastles of towing your boat.